Once-forgotten garage-psych legends the Monks are set to get a little less obscure this year thanks to a whole new wave of reissues. Courtesy of Light in the Attic, the infamous '60s outfit will see their one and only 1966 full-length Black Monk Time, as well as the odds'n'sods comp The Early Years 1964-1965, get remastered and re-released on April 14, with the label throwing in a pile of extra Monk goodies into each. 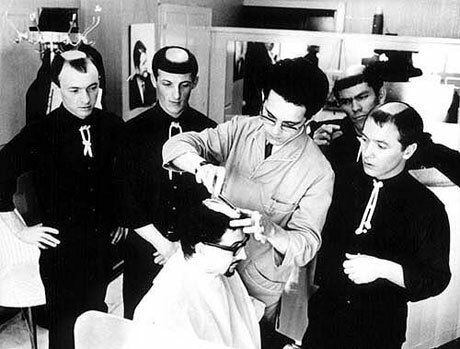 For those unfamiliar with the Monks' weird and wonderful tale, the band was made up of a group of U.S. soldiers stationed in Germany, who in the 1960s stayed in Deutschland after their discharge, shaved monkly bald spots into their hair and became one of the most freaked-out proto-punk acts in history. Receiving little to no recognition in the band's American homeland during their brief career, the Monks eventually went on to become cult darlings, influencing everyone from lo-fi punkers to the psych-obsessed to brainy lovers of the beat, not to mention making them all want to dance to pounding freakbeat stompers. Black Monk Time will include several bonus tracks, one previously unreleased song, tons of archival photos and liner notes from some of the original Monks. The Early Years will offers up a collection of the band's singles and demos, most of which are taken directly from the master tapes, and like Black Monk Time feature some new fancied-up packaging. 3. "Boys Are Boys And Girls Are Choice"
6. "Oh, How To Do Now"
8. "We Do Wie Du"
10. "Love Came Tumblin' Down"
13. "I Can't Get Over You"
15. "Love Can Tame The Wild"
16. "He Went Down To The Sea"
2. "Love Came Tumblin' Down"
5. "We Do Wie Du"
10. "Oh, How To Do Now"